ISR is back with another hard hitting sound set for Native Instruments Massive. Extreme Massive is a dark collection of presets great for producers looking to add raw sounds for music film or game sound tracks. The raw sounds contained in Extreme Massive were designed form the ground up making this insane collection of sounds a one of a kind pack. This balls to wall collection is like nothing else on the market so get ready. All the sounds you here in the demo are 100% ready to rock when u find the patch. The patches are ready for you tweak, route and unleash the beast within your next remix or production. The dope beats in the demo can be found on 6Blocc's Dubstep Ammo! So we gotcha ya covered if you need those beats in your new production. Extreme Massive's disgustingly phat ear clogging sounds await your command. This monster ISR patch collection features arctic pads, hard lead sounds, bass, and of course a slick set of drones and effect sounds to put the last nail in the coffin. The pack has some really hard sounding one shot patches, dirty low fi wobbles and a few sync based patches which can be great for Hard Techno. We even tossed a ISR Bonus Pack with 27 patches from across our other great NI Massive sound sets.. The bonus pack includes Science of Sound, Womp, Hardstep, Bass Monster, Climb and Sweep. 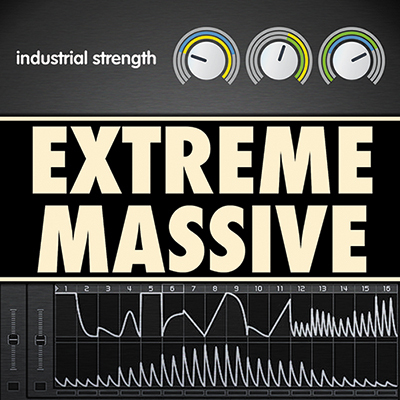 Extreme Massive is loaded up with everything u need to blow your next track or your poor speakers thru the roof.